“Ariadne auf Naxos” predates Stephen Sondheim’s “Sunday in the Park with George” and David Hirson’s “La Bête” by decades, but the situation its plot depicts brings both of those later 20th century works to mind. The first act, or prologue, of Richard Strauss and Hugo von Hofmannsthal’s opera is set in a green room of sorts next to a grand ballroom where a wealthy Viennese potentate is about to hold a lavish dinner for dozens of guests. To amuse his friends, the man has booked two entertainments. One is an opera about Ariadne, a princess abandoned on the Mediterranean island of Naxos by her love, Theseus, for whom she pines. And pines. And pines. The other is a burlesque that may have some structure but is generally improvised on the spot by the zesty Zerbinetta and her antic troupe of clowns, named Harlequin, Scaramuccio, Brighella, and Truffaldin after the comic archetypes in commedia dell’arte. Originally, a debate ensues about whether the serious opera should precede the opera buffo or vice versa. All arguing is irrevocably settled when a major domo enters to announce the host has decided that doing the opera and comedy in sequence would take too long. Fireworks, after all, are scheduled for 9 p.m. sharp, and there can be no whining Greek women or frowsy clowns left on stage to skew attention from the pyrotechnics. Rather than disappoint either company by cancelling its show, the host has decreed that the entertainments will be presented simultaneously, the comics finding ways to insinuate themselves into the distraught composer’s intense operatic drama, on which he’s labored for years and wants more time to refine. You see why the other plays enter one’s thoughts. Strauss and von Hofmannsthal may not have intended to comment on the financing of art or the clash between artistic styles, but they did so quite handily. Both the composer and the clowns depend on the patronage of the potentate to earn their fees or royalties, which they’re assured they’ll receive. The music master, though sympathetic to the composer, understands that finding, and pleasing, an impresario outweighs any compromises one must make to satisfy his whims. Hiring artists gives one privileges, and the composer has to get past anger and insult if he wants his opera performed at all. Zerbinetta and her band are exponentially calmer than the composer. They perform. They eat. They get paid. They’re happy. And this gig might lead to others. You never know. Meanwhile, Strauss and von Hofmannsthal have to solve the puzzle of how to combine Ariadne’s tale of woe with Zerbinetta’s upbeat merriment. Where and how do a gaggle of tousle-haired clowns, dressed in the contemporary garb of the street, torn faded T-shirts over a variety of wrinkled pants, find the opening to jump integrally into a fully orchestrated and costumed opera with a diva wearing a tear-stained bridal dress and nymphs sporting white sheaths and white “Cousin It” hair warbling their sorrow at full voice? Suffice to say they do, but mostly because Zerbinetta, an improvisationalist at heart and moved by Ariadne’s plight, is so clever at fitting a jolly, optimistic, and wise text within the heroine’s doleful laments. The classical artists, Strauss and von Hofmannsthal, have demonstrated that older-style works must make some way for the new and less formal to be heard while even the comic avant-garde must respect the conventions of the traditional and serious. Art of different kinds from different perspectives can exist side by side. It is possible to enjoy Mozart and Radiohead? Tony Bennett, meet Lady Gaga. Oh, you have? Terrific! Whether or not it’s a good idea to impose one genre on another by fiat, as the Viennese host does, “Ariadne auf Naxos” shows there’s room for all expressions of art, music included, to co-exist and enjoy equal favor based on the content to each individual work and the talent of each individual artist. That’s good news, especially welcome is this age of either-or and polar disdain for one style over another. Strauss musically demonstrates the blend of styles by writing a jauntily flashy, melodically acrobatic showcase of an aria for Zerbinetta while staying within established bounds of straightforward, dirge-like early 20th century vocal lines for Ariadne and muscular, heroic lines for Bacchus. Curtis Opera’s co-production of “Ariadne auf Naxos” with Opera Philadelphia and the Kimmel Center, has a lively prologue, with Lauren Eberwein’s opera composer almost inconsolable at the prospect that his serious, heartfelt, torturously significant work may be desecrated by the inclusion of village square minstrels in its performance. Eberwein, whose protests dominate this first act, sings with passion as the composer delineates all the pains he took to write his beautiful opera and bewails the indignity of having to precede a buffo, let alone to compete with buskers as Ariadne’s heartfelt pathos and their low comedy cohabit a stage. As Eberwein, who has been given a nicely cropped three-day growth of beard by costumer Jacob A. Climer, rants, throws her forearm over her brow, and gesticulates her grief with outstretched arms and wide-spread fingers, we see a foreshadow of Ariadne’s yearning in the second act. The created apple doesn’t fall far from the creator’s tree. Zerbinetta, on the other hand, is content. She bristled at first about her farce going on before the opera, but after being guided by a dancing master about the greater importance of being seen at all, she takes the matter in her stride. She is free to be the impish hoyden that informs her clowning whatever her place on the bill. Once confident of that, she can tease or try to comfort the agonized composer at will. Meanwhile, Curtis director Chas Rader-Schieber has made a busy circus of the green room, the performers playing Ariadne and Bacchus appearing in varying phases of trussing and hair preparation, the music master rattling on about the caprice of the host and the need to make do, a lackey dutifully ironing and tending to other needs surrounding the productions, the dancing master proudly strutting and spouting good advice, an officer with flowers hunting for the diva to give them to, a wigmaker in pique over the rejection of one his creations, Zerbinetta and her crew taking in all of the frenzy, and Eberwein’s composer sustaining his tantrum. Sean Plumb, a long smartly-folded silk scarf nattily placed under his suit coat collar and hanging past the lapels, sang precisely and powerfully and brought humor to the role of the music master. Roy Hage, dressed in a white shirt under a colorfully brocaded vest, and over black pants, played the dancing master with swagger and struck droll, superior poses as he surveyed the green room hubbub and kept Zerbinetta above the fray. Vartan Gabrielian endowed the lackey with a lot of personality and had the right tone for gossip and cynicism as he commented on the doings in the host’s home. While the composer takes most focus during the prologue, Zerbinetta and Ariadne, each with at least one sustained aria, dominate the second. Milanese is superb as both an actress and a coloratura singer as Zerbinetta. She conveys the unimpressed, punkily rebellious nature of Zerbinetta in her posture and approach to joining the composer’s opera, but she sings her message of consolation and encouragement to Ariadne with great sincerity and sympathy for another woman’s misery, especially since it is caused by a man. Zerbinetta, playing herself even as she pretends to be a character in the opera, feels for what she hears is Ariadne’s plight and uses her worldliness to tell the distraught princess to relax and forget her disappointment because another man will come along, and she can experience love, and possibly loss, again. Perhaps again and again in a cycle because that’s the way romance works in this world. Milanese’s Zerbinetta is practical while being witty. The singer has a lovely, expressive voice and can show the feminist independence of Zerbinetta while conveying the empathy and care she feels in regard to Ariadne’s deep and relentless sorrow. Rader-Schieber lightens the second act by his use of Zerbinetta’s henchman, all of whom in one scene are decked out like the characters in television’s “Gilligan’s Island,” and who pedal around Naxos in a dunebuggy that looks to be modeled after Fred Flintstone’s car. It’s all woven straw secured in frames carved from trees and covered with bark and has two long cylinder-shaped barrels for wheels. The clown driving it, and several of them get a turn, uses his own feet to propel the vehicle which eventually serves as a carriage to whisk Zerbinetta to her next romantic adventure with Harlequin, her choice after all four of her companions woo her as an example to Ariadne of what courtship and “love” are in actuality. Zerbinetta spoofs romance, but she makes sense as well. She is not a classic princess. She is a woman from an age when men might be considered a dime a dozen and when either men or women can be the aggressor in starting a relationship. No standing on an island waiting for her man to return and restore his affections for Zerbinetta! She will move on to the next affair and see how that plays out. She tries to persuade the grieving Ariadne to have the same attitude, but to no avail. Ariadne is committed to moping. She is an aging female Werther unable to console herself or get over the loss of her love. Her life revolves about the return of Theseus, and it doesn’t dawn on her that Theseus is not coming back. All Ariadne can do is cry and emit plaintively miserable sighs about her lost amour. Her dolor is reinforced by three nymphs who keep her company as she frets forlornly on her island and forever mourns the end of her happiness. Rader-Schieber’s production is decidedly comic in tone, and while Heather Stebbins is relentless in expressing Ariadne’s loneliness and despondency, we welcome Zerbinetta and her troupe as an antidote to all of the woeful complaining. No matter how much empathy Stebbins elicits for Ariadne, she becomes a woman who protests too much, we all think. Strauss has given Ariadne’s arias some melody, but lyrically, von Hofmannsthal has been following a single line, the story of Theseus’s abandonment and the sadness Ariadne endures as she cries and waits. The woman is inconsolable. Nothing can cheer her. She wallows in her gloom and in the unfairness of love. Both Ariadne’s and Zerbinetta’s (A and Z, opposite ends of a series) arias go on and repeat themselves — Remember 1916 audiences did not have surtitles and needed to hear libretti several times before catching each word, especially in the soprano register. — so we need some respite from them. Zerbinetta quiets Ariadne, sneaking in to claim her right to the host’s stage in the midst of an aria that seems as if it’s going to be endless. Zerbinetta’s crew makes Milanese pause in her tour de force, which is more entertaining because its content is practical and upbeat. Strauss and von Hofmannsthal show that unless a lament has variation, a more cheerful, knowing, and life-affirming attitude will trump it every time. Stebbins is not as vocally sure as Milanese. There are times when her voice breaks or she loses control, but she is a powerful and engaging singer who makes you believe Ariadne’s torment and her inability to wrest herself from the depression that consumes her. She is more precise and equally earnest in her rapture when sees a man walking towards her on Naxos and thinks Theseus has come back to claim her and resume their ardor. The man is not Theseus, a human. He is the more powerful god, Bacchus, who has just come from Circe’s island where that enchantress left him in human form but cast a spell that would make him fall in love with the first woman he encounters. Both Ariadne and Bacchus are delirious when they meet, Ariadne in mistaking Bacchus for the estranged Theseus, Bacchus in thinking he conquered Circe’s famous curses and is about to claim her as a woman for his pleasure. He is, after all, the god of revels who delights in wanton misrule and romantic folly. Like Stebbins, Kevin Ray can fill a room with full, thunderous sound that conveys the majesty of Bacchus. He practically roars satisfaction over what he believes is his victory over Circe and at finding her to be the beautiful maiden who is really Ariadne. Ray can also become short of breath and strain to keep his voice from breaking at times, but his delivery is generally sonorous and impassioned, indicating pride in avoiding Circe’s worst magic, turning men into swine and other creatures, and gratification in being able to take the woman he thinks is Circe as his beloved. As often happens with “Ariadne auf Naxos,” the lighter portions are more enjoyable than Ariadne’s endless wail or Bacchus’s declaration of triumph. In Rader-Schieber’s production, the hectic movement in the green room in Act One, and Zerbinetta’s frolics with her minions in Act Two steal focus and claim the day. Johnanthan McCullough, Mingjie Lei, Jean-Michel Richer, and Thomas Shivone have a good time being street performers as Zerbinetta’s colleagues. Each of them, especially McCullough as Harlequin/Gilligan had a moment to show off and makes the most of it. Lei is ardently sincere in his flirting with Zerbinetta while he is dressed as Thurston Howell III. Richer gets to model a bathing suit and red polka-dotted Daisy Mae blouse. Shivone provides great spirit in the Minnow skipper’s role. Playing to chorus to Ariadne and sometimes joining her in lovely harmony are Elena Perroni, Anastasiia Sidorova, and Kirsten McKinnon as the nymphs that keep the princess company and report her lachrymose suffering. Dennis Chmelensky, as the major-domo takes particular delight in reminding everyone there will be fireworks at 9 p.m. while informing them those fireworks have meant they have less time to perform their rehearsed shows. Doğukan Kuran is fussily nonplussed as the chastised wigmaker. Evan Johnson is a combination of purpose and bluster as the officer bearing flowers to the soprano (but being directed towards Zerbinetta). Various duties are performed efficiently by Catherine Logan, Ryan Tygh, Rocco DeFinis, and Maria Mavromatis as supernumeraries. Rader-Schieber’s is a good solid production of “Ariadne auf Naxos” that features high points with the frenzy backstage during the prologue and Milanese’s masterful performance of Zerbinetta’s show-stopping aria. The director had many fine ideas a number of people — Hage, Plumb, Gabrielian, and the four dell’arte clowns — made into entertaining personal vignettes. Among the voices heard mostly in harmony, Kirsten MacKinnon’s stood out for its purity and expressiveness. Jacob A. Climer had obvious fun costuming this production, going from well-tailored suits for Plumb and a spruce ensemble for Hage to the white, white dresses for Ariadne and the nymphs and the corner-boy get-ups for Zerbinetta and her troupe. The “Gilligan” sequence was nothing less than inspired. David Zinn’s green room set gives Rader-Schieber ample playing spaces while looking cluttered and frantic. His Naxos beach is expressionistic, with a black-and-white picture of a wavy ocean serving interestingly as the water and a large model of a shark-like fish trapped in a just-large-enough aquarium to add to the Mediterranean coast. Ariadne’s bit to beach was rather sparse, bordered by small white rocks that look like magnifications of Wilma Flintstone’s beads and curiously containing two blue chairs like you might see in an office or set out in an auditorium that doesn’t have permanent seating. Mike Inwood”s lighting often guides your eyes so you turn at the opportune time to see the dell’arte bunch approaching. 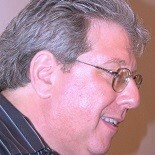 George Manahan conducted a Curtis Symphony Orchestra that gave depth to Strauss’s score, which has early 20th century overtones mixed with more traditional passages. 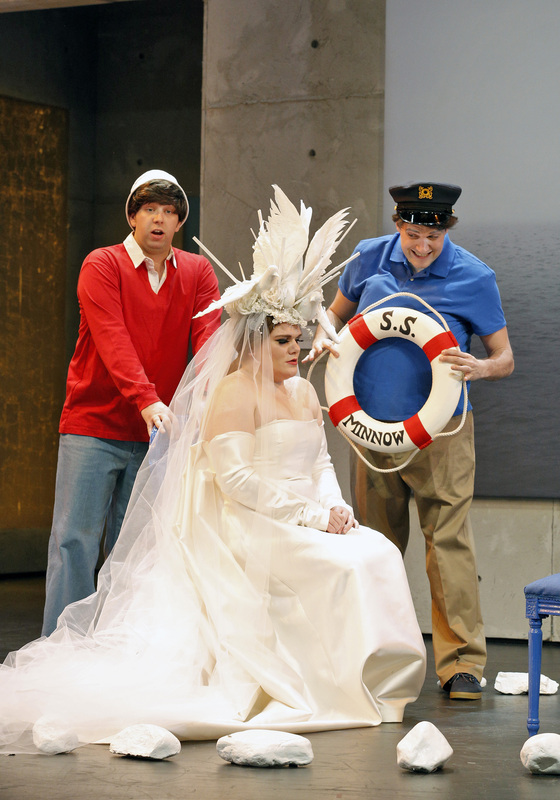 “Ariadne auf Naxos,” produced by Curtis Opera, Opera Philadelphia, and the Kimmel Center runs through Sunday, March 8, at the Perelman Theatre in the Kimmel Center, Broad and Spruce Streets, in Philadelphia. Showtimes are 8 p.m. Friday and 2:30 p.m. Sunday. The performance is in German with English surtitles. Tickets range from $155 to $35 and can be obtained by calling 215-893-1018 or by visiting www.operaphila.org. This entry was posted on March 6, 2015 by nzoren in Theater Reviews and tagged Ariadne auf Naxos, Ashley Milanese, Chas Rader-Schieber, Comic Opera, Curtis Opera, George Manahan, Heather Stebbins, Hugo von Hofmannsthal, Jacob A. Climer, Kevin Ray, Kimmel Center, Lauren Eberwein, Opera Philadelphia, Perelman Theater, Richard Strauss, Roy Hage, Sean Plumb.